Community Justice – Can healing circles help resolve business disputes and claims against Chief and Council? Disputes happen. Even within Mi’kmaq communities. Traditionally disputes were handled internally through informal processes or healing circles. In a healing circle the victim, the wrongdoer and other community members came together to talk and resolve disputes. Everyone had to agree on the outcome. There were no “winners” and no “losers”. This was a form of “Restorative Justice”. That term is familiar to anyone following the current Dalhousie Dental School scandal. Dalhousie University opted for a similar process to determine the fate of several students accused of hatred against women and unprofessional conduct. Another modern context in which healing circles have been adopted is the criminal justice system. “Sentencing circles” are an option for Aboriginal offenders. Like the healing circles, the offender, the victim, the lawyers for the Crown and the offender, and members of the offender’s community sit in a circle (literally) and each in turn has their say as the eagle feather or talking stick is passed around. The sentence imposed must be agreed upon by everyone. This approach is of course a far cry from our adversarial system of justice where each side presents its case before a single judge (or a jury) and the judge decides who wins and who loses. In the adversarial system relationships may be damaged and hurt feelings may continue for years. Unfortunately few First Nation’s community have set up healing circles or other ways to deal with internal disputes. This leaves the non-Native court system as the only alternative. 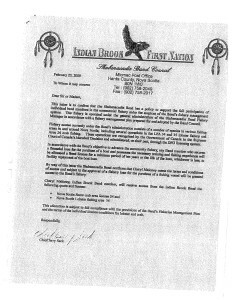 This applies to disputes between First Nation members as well as between First Nation members and their governments, which is usually Chief and Council. As Chief and Council have taken on more and more of the responsibility for government services and resource management, their power has grown. To a large extent individual First Nation members are at their mercy. Individual First Nation members can rarely participate in commercial hunting and fishing activities under communal licences without being designated by Chief and Council. You can see how important it is for Chief and Council to act in an even handed way. But what happens when Chief and Council act unfairly? Or illegally? Unless the community has established a process to deal with complaints against Chief and Council, an individual has no choice but to seek help from the non-Native courts. Take the case of Cheryl Maloney of Sipekne’katik First Nation. Chief and Council promised Cheryl that if she set up a fishing company her company could fish under one of the communal Snow Crab licences until her business loan was paid off. Here is the letter signed by the Chief that was given to Cheryl. Based on this promise, Cheryl borrowed money to buy a fishing boat and equipment – a substantial investment. The bank needed the letter in order to lend Cheryl the money. Without access to a communal licence Cheryl could not fish (unless she wanted to challenge the entire Marshall licensing scheme!) and would have no way to repay the loan. Cheryl was relying on the letter as well. She was personally responsible for the loan which had to be paid whether she fished or not. Cheryl’s company took out a 6-year loan, hired a captain and crew and fished under the Snow Crab licence for the fishing season of 2009. Things went well until the fishing season of 2013. Without any notice to Cheryl and without giving her any chance to speak against the idea, Chief and Council decided to allocate the fishing licence to a non-Native fishing company for the 2013 and 2014 fishing season. This ignored completely the earlier promise to Cheryl to let her company fish under the licence for the 6 years it would take to repay the bank loan. 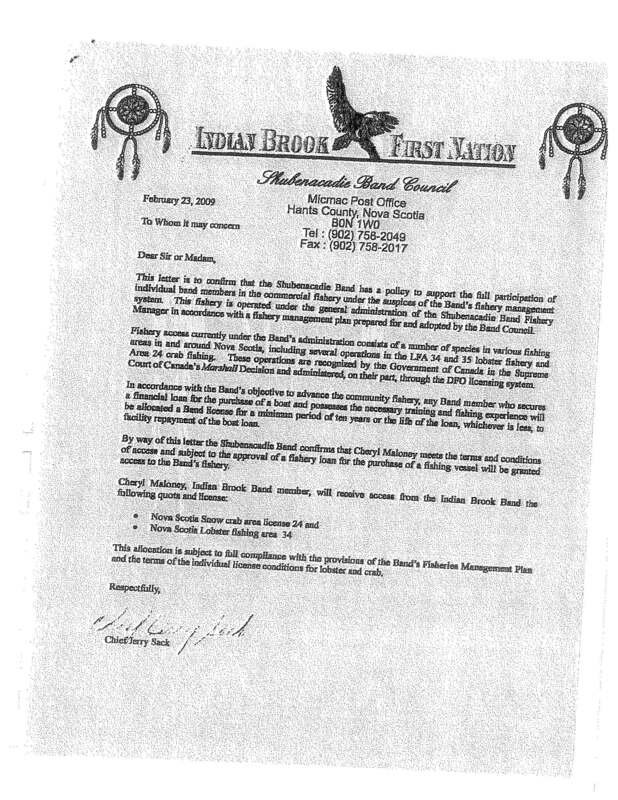 With no internal dispute resolution process available, Cheryl could either give up and accept the decision of Chief and Council or go to court and ask a judge to decide whether Chief and Council had acted illegally in a legal process known as a “judicial review”. Cheryl did not want to back down. She decided to stand up to the injustice in her case as she had done many times before for others. When Cheryl came to see me, I agreed to represent Cheryl. I didn’t ask for Cheryl to pay my fees up front. I knew it would be expensive. We agreed to wait until the outcome of the case. On February 5, 2014 the Federal Court of Canada in Maloney v. Shubenacadie First Nation set aside the decision of Chief and Council to issue the Snow Crab licence to a non-Native fishing company. Cheryl had won the case. However, this did not end the matter. Chief and Council had to decide again who would fish under the licence for the 2014 season. They decided again not to let Cheryl fish under the licence. Again, Cheryl had no choice but to go to court. So she has sued again, this time in the Nova Scotia Supreme Court. She is seeking compensation for the loss of fishing income she suffered when Chief and Council decided not to honour the earlier agreement that she would have the licence for 6 years. That case is still before the courts. Cheryl, now a Council member herself, has been trying to engage her Chief and the rest of Council in a discussion of her case in the hope that it can be resolved without going to Court. However, Chief and the rest of Council have been advised by their lawyers not to discuss the case with her, a traditional tactic in the non-Native legal world. This case presents an opportunity for Chief and Council to take a hard look at how community members can pursue legitimate claims against Chief and Council. Cheryl has already won once before. Rather than pretend that Chief and Council are always right, why not accept the fact that everyone makes mistakes and that people may need to be compensated when those mistakes cause losses. Why not create a process that allows claims to come forward and be dealt with fairly and quickly. Hopefully such a process would include elements of traditional Mi’kmaq dispute resolution. The stakes are high for economic development. In order to grow First Nation businesses and attract outside businesses to the community’s Reserve lands, business people must have confidence in the First Nation’s ability to govern itself. Will it honour its promises? Will it follow the decision of the courts? Does it have a fair process in place to deal with claims by its members against it? A healing circle to resolve business disputes may seem foreign to many non-Native business people. Indeed many Native business people may be unfamiliar with a healing circle as well. However, the rising cost of litigation and delays in getting trial dates in court, have led many business people to turn to private arbitration where a private judge hears and decides the case. While this is quicker than going to court it is still expensive and it is an adversarial win/lose process. A healing circle could be just as quick and effective as an arbitration. Maybe even quicker. If so First Nations could lead the way in commercial dispute resolution and gain a competitive business advantage. It will take a mature and forward looking community to move in that direction. Who knows, maybe Cheryl’s claim could be a test case. Does your community have a process in place to resolve disputes against Chief and Council? Does it use healing circles to resolve disputes?